Here, I want to present, without comment, Dan Flavin’s two tributes to the French poet, Guillame Apollinaire, which were shown at the Morgan Library’s recent exhibit, Dan Flavin: Drawing (17 Feb – 1 July, 2012). 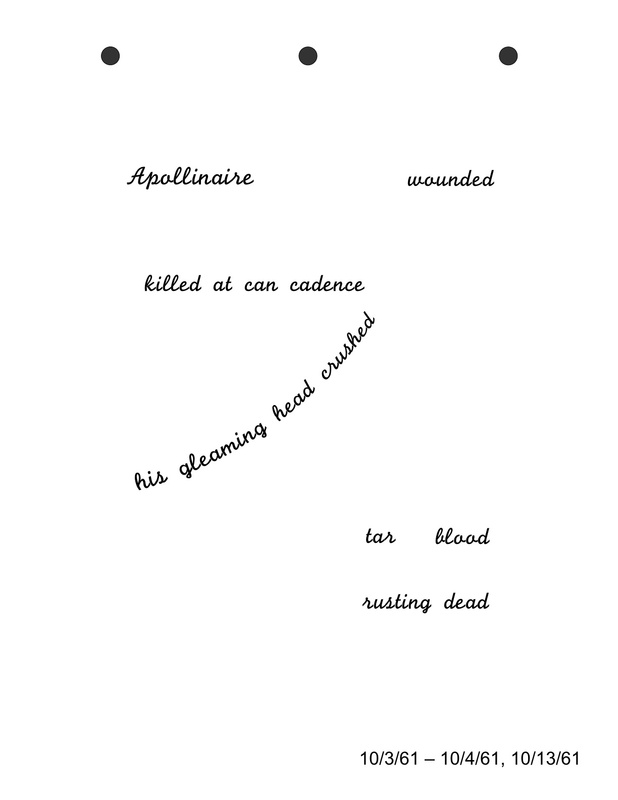 The first, “Apollinaire Wounded (to Ward Jackson),” 1959-60, was a thick white painting, square, on wood, a flattened tin can occupying the center, wider than tall, placed end up, and resembling the poet’s bandaged head after his shrapnel wound of 1916. In the top left corner, in cursive script, the words, “Apollinare wounded.” Around all this, a thin black line as a frame, then more white before the edge of the painting.